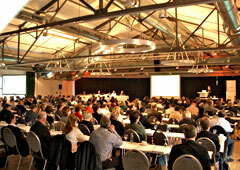 From 22 - 23 November 2007, the 2nd QP Forum of the European QP Association took place in Berlin, Germany. On the 21st, a Pre-Conference Workshop was held for the recently founded IMP QP Subgroup of the QP Association. Dr Bernd Renger, Chairman of the EQPA welcomed more than 200 delegates, representing almost 30 countries. Qualified Persons, executives from the pharmaceutical industry and representatives from various national authorities informed themselves about the latest developments. Bernd opened the Forum with an overview about the activities of the EQPA which currently has close to 900 members and associate members. One important step in the young history of the Association was taken just a few weeks before the Forum. Dr Bernd Renger and Richard Bonner represented the EQPA at the EMEA GMDP IWP Interest Parties Meeting in London. Beforehand, a survey was conducted to identify the expectations of the EQPA members. Based on the information given by the members, the Board members were able to provide substantial and comprehensive feedback on EMEA's Position Paper on QP Discretion. The first speaker, EMEA's Piotr Krauze, gave a detailed overview about the role of EMEA and the QP within the European legislative framework. Piotr encouraged the QPs to keep abreast of new quality and GMP developments. The QP Association should facilitate the continuous learning process and contribute to proposed legislation and guidance. EMEA also asks the QP Association to be prepared to provide upon request from the EMEA information on specific topics, practical examples and experiences and to point out operational problems within legislative framework. Other speakers from the EQPA, the pharmaceutical industry and national regulatory authorities shared their views on roles and responsibilities of Qualified Persons. Release requirements for APIs, Biotech and Blood Products were presented and the various aspects what personal and technical skills a QP needs to have were elaborated. The European Qualified Person Association also invited representatives from other interest groups for the 2007 Forum. John O'Sullivan who represented EFPIA pointed out the strong need to update EU GMPs to clarify the QP responsibilities. He also suggested speaking of accountabilities, not of responsibilities. The QP should also be allowed to delegate duties (not responsibilities) to non-QPs. Those duties should not be further expanded in future updates of the EU GMPs. It should be beneficial for the QPs if the EMEA Reflection Paper on QP Discretion was incorporated with the feedback given into EU GMPs. Consistency across the Member States would be highly appreciated. Graça Mata talked about the expectations of the Active Pharmaceutical Ingredients Committee (APIC), which are in line with those of EFPIA and EQPA. An alignment of the responsibilities and duties of QP and the enforcement of the respective directives across the EU should be the overall goal. A set of parallel sessions gave the delegates the possibility to work on various case studies. Possible problems and scenarios were thoroughly discussed. The focus of these interactive sessions was on Batch Release, import and IMP requirements. The QP Forum was completed by a highly appreciated social event on Thursday evening. After a guided city tour through Berlin, the participants had the possibility to continue their discussions and share their experiences with their colleagues in a relaxed atmosphere in the Wasserwerk, an event hotspot in Berlin. Besides the extensive programme, the aim of the 2nd Forum was also to present a platform for sharing experiences and discussing the various aspects of the QP's daily work. The Advisory Board encouraged the members to further support the Association in their current and future activities and also asked for ideas and active participation in the next QP Forum which will be held from 3 - 5 December 2008 in Munich, Germany.